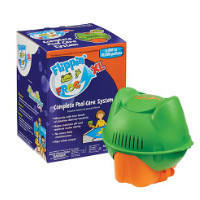 Flippin’ FROG XL is a one-of-a-kind shortcut to clean. Instead of lugging buckets of chlorine daily, you simply switch out the orange chlorine cartridge when it flips over—just once every 3-4 weeks. Unlike floaters, Flippin’ FROG kills bacteria two ways—with FROG Minerals and a small amount of chlorine. The result is Fresh Mineral Water® that is silky smooth, easier on suits, and we promise, you won’t miss that chlorine smell. 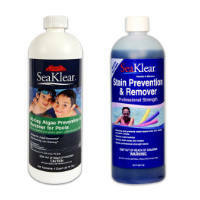 Sea Klear Stain Prevention & Remover is a professional strength blend designed to remove and control metal based staining on pool surfaces as well as water discoloration. Stain Prevention & Remover also helps keep scale from forming on surfaces and reduces the likelihood of buildup in filters and on pool equipment. Both stubborn old metal stains and existing scale buildup may require a complete cleaning of the surface prior to using Stain Prevention & Remover. 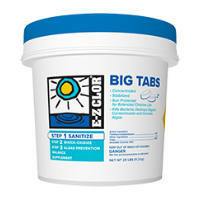 E-Z Clor Big Tabs: The key to maintaining a crystal clear pool is a steady routine of sanitization. E-Z Clor sanitizers are designed to kill bacteria, algae and other living organisms. E-Z Clor Sanitizers have built-in protection from the sun to maximize chlorine life.